Bako National Park tour is a must go when you are in Kuching if you are into nature and wild animals. Bako is one of the oldest national park in Kuching Sarawak. 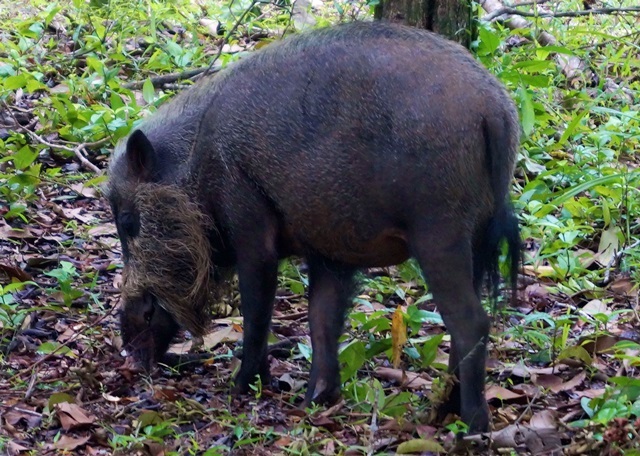 Wild snake and wild boar, one of the local occupants at Bako National Park. Wild plants ie. wild durians and pitcher plant. Bako offers outstanding diversity of natural landscapes in a relatively small area. Its a beautiful dense rainforests and stunning beaches and home to many flora and fauna including the rare proboscis monkey. Try and spot them during low tide as they forage in the exposed Mangrove tree swamps. There are 16 color-coded jungle trails as well as lodges for overnight stays - which you have to book early. We have our private simple accomodation with own bathroom available for visitors. On the high ground, look out for pitcher plants. And beware of the monkeys, they are very clever and compulsive thieves! 50% is needed payment online and once confirmed, the balance to be paid later. 0830 hrs – Pickup from hotel and drive about 35 minutes to Bako Village. From the village, take about a 25-minute boat ride (depending on the tide) to the park situated on a peninsula. Bako is one of the best places in Sarawak to see wildlife in a natural setting. The various types of animals that are commonly spotted at Bako include the proboscis monkeys, silver leaf monkeys, long-tailed macaques, wild boars, monitor lizards and numerous species of birds. Forest types range from mangrove to kerangas (heath forest), tropical swamp vegetation, cliff vegetation and beach vegetation. There are several trails to follow inside the park depending on level of fitness and interest. The park’s coastline is dotted with small bays, coves and beaches. After dinner go for a jungle safari night walk. Overnight at the park accommodation. Following breakfast, depart for a final hike on one of the trails spotting rare migratory birds and searching for the rare and elusive proboscis monkey, a primate only found in Borneo. Return to Kuching mid-afternoon. Include: Tour & transfer, meals (B=breakfast, L=lunch, D=dinner), 1 night stay at park accommodation (basic private room with bathroom attached), entrance fee, English speaking guide. Exlude: guide tipping RM5 per pax per day, personal items.